Emerging Markets: Where Are They Now? 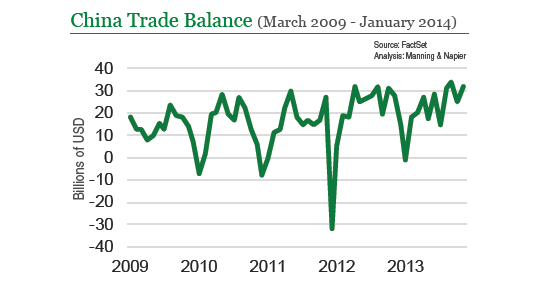 Investor nerves were on display early in 2014 as incoming macroeconomic data showed signs of softening and other notable developments led to worsening capital outflows from emerging markets, more currency weakness, and in some cases, decisive policy action. The pickup in volatility impacted a variety of major global equity markets, but emerging markets bore the brunt of recent weakness. By early March the MSCI Emerging Markets index was down a little more than 3% for the year. That slide followed a -2.6% return in the Emerging Markets index last year. The reduced appetite for emerging market assets really began to gain steam after former U.S. Federal Reserve Chairman Bernanke hinted in May 2013 that the central bank might start hitting the brakes on quantitative easing (QE) as early as last September. Attempting to stay ahead of the pack, investors lightened up on emerging market exposure with the thought that rising interest rates and improving economic fundamentals in the developed world were setting the stage for a more attractive risk/reward opportunity in developed markets going forward. While concern surrounding U.S. QE remains a driving force in the trend of capital outflows from emerging markets today, particularly as the Fed announced a second $10 billion reduction in monthly securities purchases following its January meeting, other factors are also at play. Some recent news out of China, significant currency devaluations in countries such as Argentina and Turkey, as well as political turmoil in Ukraine involving Russia, are among causes of renewed market jitters. China is arguably the most important emerging market given its size and the impact it can have on the global economy. A focal point for investors during recent years has been the nation’s decelerating GDP growth rate. China’s economy is experiencing a slow but important transition away from being driven by investment and exports, to a more sustainable economic model that is driven by domestic demand and consumption. During the past few years many investors have worried that the long transition could cause Chinese growth to collapse along the way. This clearly hasn’t happened. Real GDP in China continues to expand in excess of 7% per year, but investors remain laser-focused on macro indicators. Indeed, downdrafts in two widely followed Purchasing Managers’ Index (PMI) reports early this year provided fuel for the latest flare-up in China growth fears, and that anxiety has spread across emerging markets more broadly. 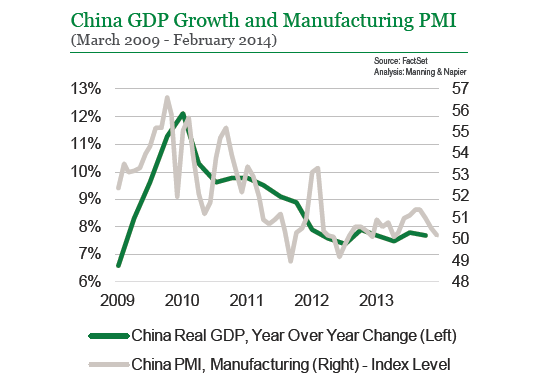 In January, the Markit/HSBC China Manufacturing PMI descended below the important 50 level. Readings below 50 are a sign of deteriorating conditions in the manufacturing sector. China’s official PMI figure (compiled internally by the National Bureau of Statistics of China) also trended down early in 2014. Another flashpoint in the China story relates to wealth management products (WMPs). WMPs are similar in nature to high-interest deposit accounts offered by banks and other financial institutions. Financial institutions then use the deposits for lending or other investment purposes. The latest concern pertained to a specific $500 million Chinese WMP that was on a path toward default. Investors worried that default might present systemic risk to China and reverberate throughout the economy. Fortunately, the Chinese fund company responsible for managing the product reached an agreement to repay investor principal and contagion fears subsequently waned for the time being. We like to highlight China when talking about emerging markets not simply because it is a major global player, but because we think the country is headed in the right direction over the long-term. We cannot say the same about a number of other developing nations. When the downward pressure on emerging markets took hold last year we noticed that investors were selling emerging market assets indiscriminately. Their only concern was getting out. Consideration of a country’s economic fundamentals or the aspirations of its leadership appeared to be largely absent. We disagreed with this notion of avoiding developing nations altogether because we continued to see positive developments in certain countries such that they were attractive from a long-term investment point of view. We were, and still are, comfortable making investments in some emerging markets, namely those that are not heavily reliant upon foreign capital. At a high level we divided emerging markets into two buckets: 1) countries with current account deficits, fiscal deficits, large debts denominated in foreign currency, and a lack of progress toward implementing reforms, and 2) countries with more stable current accounts and fiscal balances, limited foreign debt, and evidence that leadership is focused on making reforms. As 2013 wore on investors became more discerning; countries in the former camp were especially hard hit, while markets in the second bucket showed more resilience. In our view, China is a good example of a country that falls squarely in the second bucket. In addition to having little need for foreign capital given that its external and fiscal accounts are in good shape, the nation’s elected officials have also shown that they are serious about pursuing reforms. The major news on China’s reform plans came last November when leadership unveiled decisions made during the Third Plenary Session of the 18th Communist Party of China Central Committee. The comprehensive list of reforms covers a variety of areas such as relaxing China’s one child policy, promoting more private investment in state-owned enterprises, and taking action to reduce corruption in business and government, among many others. From an economic growth perspective, we believe China’s reforms should lead to more sound management of the economy and lower its overall risk profile. There is a possibility that growth could come under pressure in the near-term as the initiatives begin to take shape, but ultimately we think they help improve growth potential in the long-run. While we acknowledge that China’s economic growth has decelerated and immediate-term trends point toward incremental weakness, we think growth is in the process of stabilizing. We view China’s reform plans favorably and have confidence in leadership’s ability to follow through on them. Related to this, when considering some potential risks surrounding aspects of China’s financial system such as WMPs, we believe policymakers stand ready to act if major stresses become evident. The Chinese banking system can be thought of as an extension of the Chinese government. There are a variety of tools at their disposal and we do not think officials would hesitate to use them. Brazil and India represent examples of countries that fall in the first bucket that we see being riskier in today’s environment. Both nations have potentially problematic fiscal and current account positions. Reform progress, or lack thereof, is also a concern. For example, we have seen the Brazilian government become more interventionist in the private sector and economy lately. Some degree of government involvement in the business sphere is good and necessary, however we think Brazil has been overstepping this boundary such that it negatively influences the country’s risk profile. India’s leadership has also yet to instill in us a sense that they are focused on rectifying the major structural issues that we believe represent the primary impediments to better economic growth. We think efforts to improve infrastructure that reduce or eliminate growth-damaging logistical bottlenecks could be very beneficial to businesses. 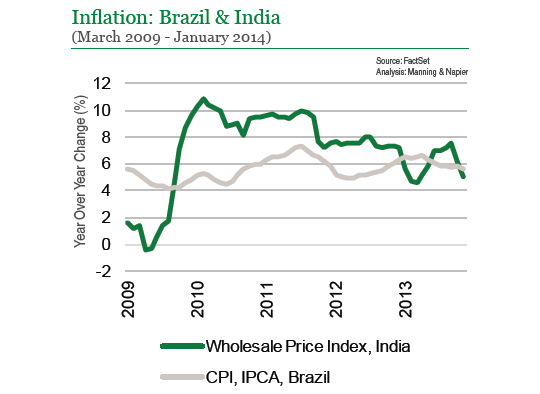 Also unlike China, Brazil and India are grappling with inflation. The Central Bank of Brazil and Reserve Bank of India continued to tighten monetary policy early this year by raising benchmark interest rates in an effort to keep escalating prices in check. Higher rates can help contain inflation, and we have seen some success in this regard, particularly in India since Raghuram Rajan took the helm at the Reserve Bank of India, but in our view, monetary policy can only do so much. Logistical bottlenecks and generally poor infrastructure are major factors that we believe make inflation sticky in countries like Brazil and India. We believe political institutions in these countries need to concentrate on infrastructure spending and supply-side expansion to assist the central banks in tackling the inflation issue. While inflation is by no means a pressing global concern at this point, the potential for further currency weakness in developing economies could exacerbate inflationary pressures more broadly. 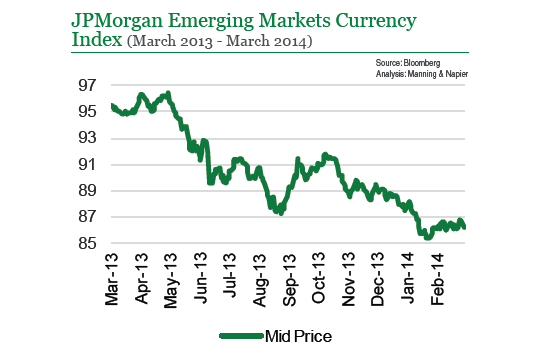 As illustrated by the JPMorgan Emerging Market Currency Index, currency values fell sharply early in 2014. Several countries such as Argentina and Turkey experienced historic intraday devaluations. The Russian ruble was also materially weaker as tensions with Ukraine came to a boil during March. In Argentina’s case, the economy has struggled for years and rampant inflation has been a consistent problem. Argentina’s central bank had previously been intervening in the markets to defend the peso, but with foreign currency reserves dwindling, leaders opted to stem that support in late January. This resulted in the largest one-day decline in Argentina’s currency since the country defaulted on its sovereign debt in 2002. In Turkey, large deficits and political uncertainty precipitated a sharp decline in its currency, the lira. Turkey’s central bank responded aggressively and more than doubled the benchmark weekly repo rate, boosting it to 10%. The Russian ruble’s slide intensified after protests erupted in Ukraine and Russia sought to intervene. As vigorous street protests led to the ouster of democratically elected Viktor Yanukovych, during late February, Russia has subsequently deployed troops in several areas of the Ukraine, rattling neighboring countries as well as global markets. The very fluid situation on the ground has led many to sell Russian and Ukrainian securities and has resulted in huge capital outflows from both countries. The weakness in the currency led Russia’s central bank to respond by lifting its benchmark lending rate from 5.5% to 7%. Raising benchmark interest rates is a standard central bank response to capital flight, currency weakness, and rising inflationary pressures. Indeed, policy adjustments can help mitigate some of these strains, however higher rates are also a headwind to the economy and will be growth-damaging going forward. Broadly speaking, emerging markets clearly have their share of problems, but we continue to caution against painting developing nations with a broad brush. We think capital outflows are likely to exert downward pressure on countries that need the funds the most, while nations with healthy fiscal positions, solid current account balances, limited foreign debts, and leaders that are working toward reform, are in much better shape to weather the storm. 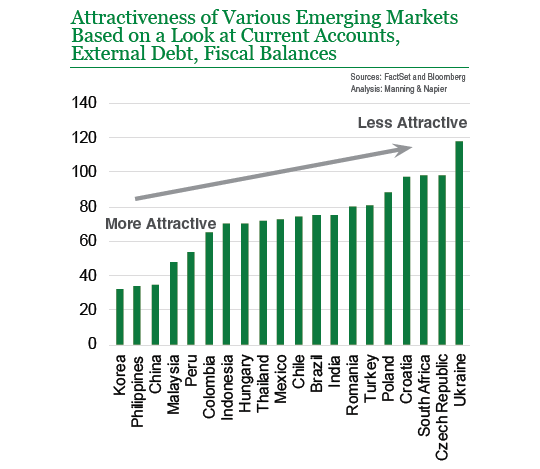 To illustrate this concept, below is how we rank the relative attractiveness of various emerging markets from the perspective of current accounts, external debt, and fiscal balances. While certain emerging markets rank better than others, the above is not meant to suggest that long-term investment opportunities will only exist in the countries labeled attractive on this scale. At the individual company level compelling absolute return potential will be available even in countries with less attractive macro assessments. We believe the key to capitalizing on those opportunities is flexibility and discernment. Even with strong prevailing headwinds today, we think there are a variety of companies in countries such as Brazil and India that are worth exploring especially as valuations have gotten much cheaper. 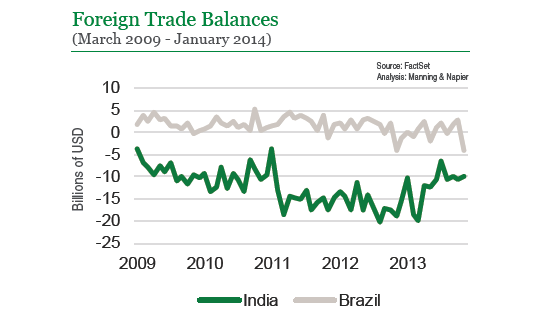 Several of the portfolios we manage contain exposure to Brazilian and Indian businesses. The companies we like operate in sectors and industries that are largely insulated from the challenging domestic macro environments. Stated differently, the potential success of these businesses does not require robust GDP growth in their country of origin. Moreover, we embed the difficult economic picture into our company-specific expectations and valuations. Certain emerging markets have a long and difficult road ahead of them to be sure, but that doesn’t mean all businesses in those countries are destined to struggle. Just as we are not advocating that investors completely avoid emerging markets, we are also not suggesting that now is the time to open the floodgates and dramatically overweight stocks in developing economies. There are certain forthcoming developments that we need clarity on before we would recommend a broader push into emerging markets. One factor is related to further potential fallout from subsequent reductions in U.S. QE. To the extent that sentiment surrounding emerging markets continues to wane as the Fed ratchets back securities purchases, the outflow trend might have a lot further to run and that’s not something investors want to be in front of. Emerging markets have been notably weaker immediately following the Fed’s recent QE reduction announcements. This suggests that the end to QE is not fully discounted yet. We also want to see evidence that economic fundamentals in emerging markets are at or near the trough. When emerging market central banks did an about face and began tightening monetary policy to support currencies, ward-off inflation, and entice foreign capital to stay, they also accelerated through the middle portion of their economic cycles. Emerging markets in general now appear to be in more of a later cycle phase, characterized by low valuations, slower growth, and rising interest rates. We are looking for additional verification that deterioration in economic fundamentals is nearing an inflection point before recommending a step-up in emerging market allocations. Lastly, a variety of important elections are scheduled to take place in key emerging markets this year. Given our view of the importance of building momentum around emerging market reforms, and the fact that political and leadership environments are critical to that movement, we need to see the outcome of these elections before wading deeper into emerging market stocks. Below is a list of some of the major elections we will be following this year. The global economy remains on a slow growth path and we expect that to remain the case for the foreseeable future. The challenging global macro environment has brought forth a variety of unusual and large scale policy initiatives, some of which are beginning to be unwound. The confluence of these forces has resulted in distinct downward pressure on emerging market assets over the past year or so. The way forward for emerging markets will contain obstacles, the potential for ongoing capital flight and resurging inflation to name a few; but we expect that some businesses will be able to transcend the weakness and reward investors in the long-run. A cautious approach that is cognizant of both macro threats and company-specific opportunities is how we intend to navigate emerging markets going forward. Sources: Bloomberg, Financial Post, CNBC, Seeking Alpha, Reuters, The Forex Market, Forbes, The Guardian, Greater Pacific, live mint, FactSet, Money News, Al Jazeera, New York Times.